Using all 584 candles would have been a fire hazard. For me, there is Riesling, and then all other wine grapes. I'd never refuse a Pinot Noir or Chenin Blanc, but drinking Riesling feels like coming home—it fills my heart. Riesling vines, likely native to Germany's Rhine Valley, were well-tended by Benedictine and Carthusian monks and the noble families in the 15th century. However, it wasn't until some 200 years later that Riesling's popularity took off. At the end of the Thirty Years' War, when the French were given control over Alsace in 1648, most of the destroyed vineyards were replanted to Riesling. Recognizing a good idea, Schloss Johannisberg, in Germany's Rheingau region, replanted all of its vineyards to Riesling in 1720. Mosel quickly followed and, in 1787, the Elector of Trier at the time, Clemens Wenzeslaus, decreed that all "bad" vines should be ripped out and replaced by Riesling. The frenzy was underway. The next century marked Riesling's apogee. In the late 1800s, German examples enjoyed a global reputation and garnered prices on par with those of Bordeaux first-growths and Burgundy grands crus. Britain's Queen Victoria was a noted devotee. In 1900, Egon Müller, the famed estate from the Mosel's Saar district, won a Grand Prix at the Paris Exposition International. Riesling was Germany's pride and joy, and its most widely grown grape. But Riesling's birthplace also happens to be the site of its decline. World Wars I and II resulted in the mass destruction of Germany's vineyards; afterward, the country's wine industry focused largely on quantity over quality. That drift favored earlier-ripening, less finicky varieties such as Silvaner and Müller-Thurgau. Riesling vines that remained were trained to produce higher yields, resulting in inferior wines. Products like Liebfraumilch and similar mass-produced German wines, easily recognized by their signature blue bottles, drove down sales of estate-grown and single-vineyard Rieslings. Throughout the 1980s and early '90s, top-quality Riesling was an insider's secret. But you can't keep a noble grape down. In 1996, Riesling regained its title as Germany's most widely planted variety. It's grown on every continent besides Antarctica, yielding world-class wines from Alsace in France as well as Austria, Australia and Washington and New York in the U.S. The banks of Germany’s Mosel river are home to arguably the world’s finest Riesling vineyards. But what makes Riesling so special? It's remarkably versatile. It can be lightweight and super-delicate, yet still burst with aromas and flavors. It's a late-ripening variety yet achieves flavor complexity at lower sugar levels than other grapes. Riesling's transparency allows it, in my opinion, to transmit terroir in a way that no other grape can. When harvested at low yields, without winemaking interventions, Riesling excels at showcasing a distinctive sense of place. Finally, Riesling is supremely ageable thanks to its naturally high acidity, which conserves its freshness for years. Buttressed by residual sugar, dessert-style Rieslings age effortlessly for decades. The wine is made in myriad styles, both still and sparkling, from dry to off-dry to lusciously sweet. Winemakers in Slovenia, Austria and northeast Italy are making orange wine–style skin-contact Rieslings. Traditionally, Riesling has been fermented in large, neutral oak barrels to round the wine's acidity and add depth and complexity, but stainless-steel versions, with racy freshness and purity, have gained in popularity. Chefs and particularly sommeliers have embraced Riesling. Perhaps it's the delicate nature of modern cuisine that spurred this trend, a rejection of the big, oaky wines that can overpower a meal. Riesling's purity, fresh fruit, mouthwatering acidity and lack of new oak flavors make it an inspired choice with food. Riesling is the wine world's best-kept secret. Selfishly, I'm glad. Few great grapes are so affordable, with so many outstanding examples priced at less than $50. But I'm not going to keep it to myself, at least not today. 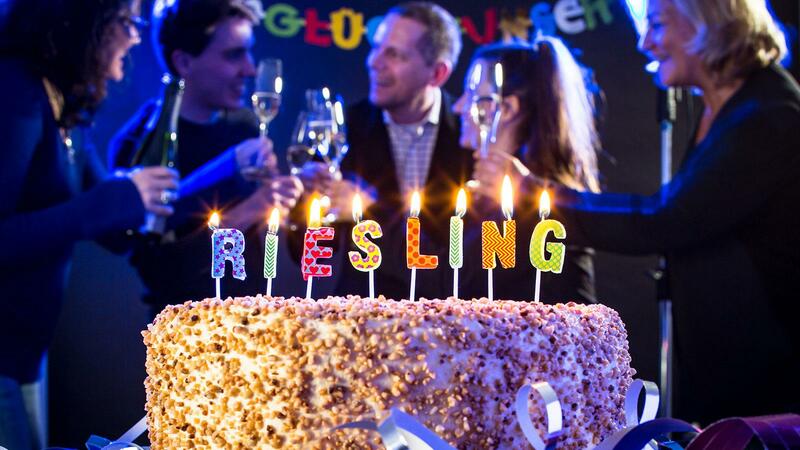 Happy birthday, Riesling! Shloss Johanisburg has an iron gate with an arch that has in iron letters (in German) "Der erste reisling Wiengut in die Welt". The castle overlooks 40 miles of the Rhine, all south facing slopes full of vineyards. Rudesheim , a wine party town is a mile away, an hour boat or train ride from Wiesbaden. 20-30 wineries are in the area. You can ride a gondola to the top of a 1000 ft hill, walk to the Shloss and taste or buy, or tour some of the wine stands on the way down through the vineyards back to Rudesheim. Stay a couple of hours and sing some drinking songs in the wine bars with your new best friends.